Labelling client files and storage boxes with the Dymo LabelManager 420P is a breeze. The 420P is a handheld label maker capable of printing on label tapes up to 3/4" wide, and the labels can be virtually any length. Furthermore, it is capable of printing on labels that are available in a wide variety of colors and can print everything from simple text to icons, shapes and barcodes. 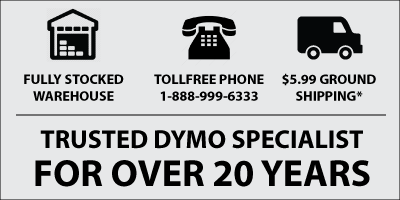 The Dymo 420P uses Dymo's versatile D1 tape system. With Dymo's D1 label system, users have a lot of scope in what they can create on the LabelManager 420P. For instance, it supports label widths of 1/4", 3/8", 1/2" and 3/4". As in the picture, using a wider 3/4" labels enables you to create labels with 2 lines of large text, along with an image or icon. The picture on this page shows 2 different labels (i) storage box label and (ii) shelf label. To create either on the LabelManager 420P you could use the LCD panel and keypad on the Dymo label maker or you could connect the LM420P to your computer and use Dymo's DLS software (which is a free download from Dymo.com). The Dymo LabelManager 420P is available for shipping from both our East and West Coast warehouses meaning fast delivery throughout the country. Furthermore, the full range of Dymo D1 tapes are stocked in both warehouses, so getting labels in a hurry is simple.